Spring is in the air in the south of France. 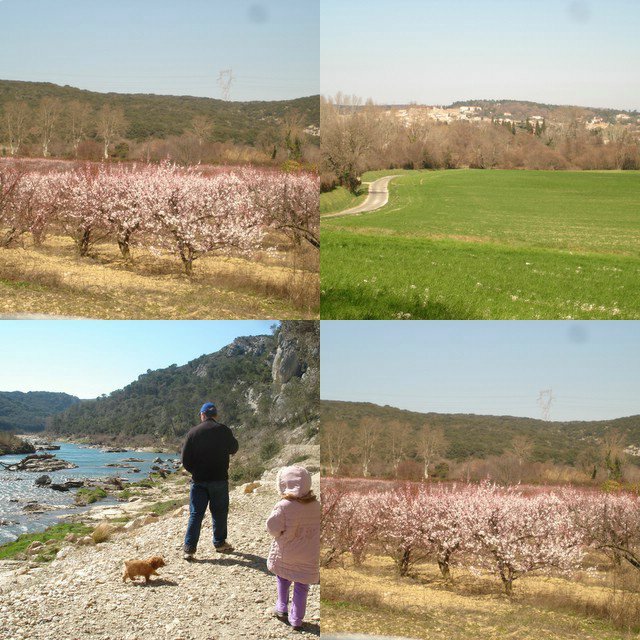 The cherry blossom trees are blooming and the fields are sprouting their green carpeting throughout the valleys. It is beautiful here with the blue, blue sky and sun shining on our faces. Spring has been longer in coming then we expected with the advent of the mistral winds from November through February. According to the meterologist, February has an average of 15 days in which the mistral blows. In March we are only suppose to have 4 days of cold winds with the temperature warming up and some possible rain coming our way. We hope they are right!We have found that when the dry cold air coming from the Northwest blows hard, the sky is left with a clearness unseen in most places and an unbelievable blue sky unique to Provence/ Languedoc. The air is brisk and biting and the sunshine is harsh and blinding. These icy cold winds cry for us to wear warm hats, down coats, sunglasses and gloves on our daily walk.Why the Mistral evokes romantic dreams in visitors and why so many restaurants and bed and breakfasts are inevitably named Le Mistral, is hard to explain. It is reported that when the mistral blows, it sets most people on edge and like a full moon everything is blamed on the mistrals. Therefore, if you are having a bad day go blame it on the Mistral winds.